The Singapore-based cryptocurrency exchange, Kucoin, announced its very first project, MultiVAC, to be launched on Kucoin's Spotlight launchpad, an equal to Binance’s launchpad. KuCoin exchange announced the first project of Kucoin Spotlight, called MultiVAC, reportedly, the project is the first of its kind that is hosted on the KuCoin Spotlight platform. Interested users must hold KuCoin shares token and participate in MultiVAC Spotlight/ Initial Exchange Offering. Kucoin calls itself 'the people’s exchange', which is why Spotlight is profiled as the people’s IEO launchpad. Tokens can be purchased using KCS only, Kucoin’s native token, which has appreciated in value significantly since Spotlight was unveiled. We are pleased to announce the first project of KuCoin Spotlight: MultiVAC (MTV). The announcement made by Kucoin explains that MultiVAC is developing the world’s first quick, efficient, and fully sharded blockchain. Sharding is not only used for computation, but also transmission and storage, maximizing throughput while maintaining decentralization, all without sacrificing security. MultiVAC has received 15 million USD in Round A strategic investments from IDG, NGC, Hashed, Signum, Arrington XRP, Dfund, ICODrops, etc. The CEO of Kucoin exchange Michael Gan was also happy to share the announcement with his followers. 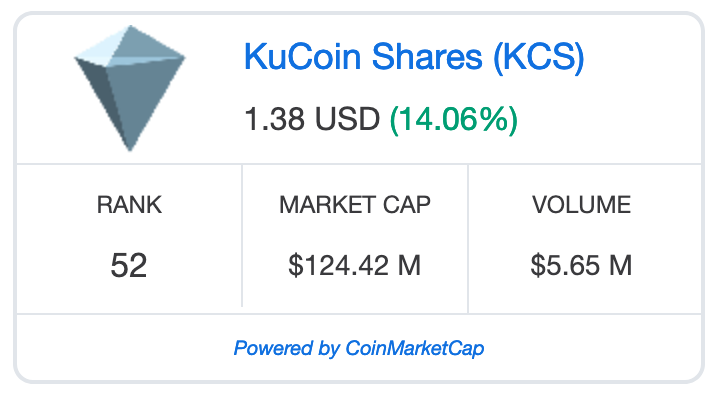 Kucoin is currently trading at $1.38 and shows an impressive gain of more than 14% in the past 24 hours, according to the data provided by Coinmarketcap, while taking the 52nd position with a market cap of $124,548,547.